The Port Authority of New York & New Jersey announced yesterday that British Airways is to move from Terminal 7 to Terminal 8 at New York JFK in 2022. This is part of a $13bn improvement project at the airport. Low cost carrier JetBlue will be expanding from Terminal 5 to cover the space currently occupied by Terminal 6 and Terminal 7. British Airways and American Airlines will be operating out of Terminal 8, which is to be expanded at a cost of £250m. This isn’t going to happen overnight, clearly, but it is a little odd that it is happening at all given that BA is in the middle of spending $65m upgrading its facilities in Terminal 7, soon to become a heap of rubble. If you are heading to Twickenham for the Six Nations games over the next few weeks, there are new Avios collecting opportunities available. 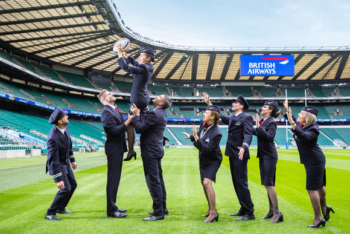 As part of the British Airways sponsorship deal with the stadium, you will earn 5 Avios per £1 when you spend in selected bars on-site and in the BA Fan Village. You must register your credit card in advance via this site. You will also earn 5 Avios per £1 if you book for a dinner that Twickenham is hosting with Tom Kerridge on 4th April. £199 for a five-course meal with paired wines, cooked by a 2-Michelin starred chef, with a pre-dinner cocktail reception, looks interesting. For an extra £50 you can attend a 2nd pre-pre-dinner cocktail reception in the England changing room! The evening includes a Q&A with Kyran Bracken and MasterChef semi-finalist Neil Back. Thanks to Amy for this. Back in December we covered the addition of 55 ‘Small Luxury Hotels of the World’ to the Hyatt booking system. Interestingly, having status in World of Hyatt isn’t worth anything at SLH hotels except for a status bonus on the points you earn. The benefits are fixed. You will earn 5 base World of Hyatt points for every $1 spent. “Following discussions with Airbus, Qantas has now formalised its decision not to take eight additional A380s that were ordered in 2006,” a Qantas spokesman said. OT – when do the Amex referral bonus post? Normally around the time the new card is dispatched. Most of the time I know the card is on the way because the points arrive in my account. Within 48 hours of acceptance usually. @Dan: are you a bit of a ‘worrier’? 1) With the AMex Travel Spend £200 get £50, does it have to be one transaction or cumulative? 2) How long from application acceptance for Amex Platinum does it take for Priority passes to arrive, travelling on in a couple of weeks? 3) Anyone managed to get madlives booking with Marriot points on the 5 night for 4 offer? IF so which one? 2. Very quickly. Sometimes before the Amex arrives. 3. Can’t help with that one. 3. Yes, spent this Christmas at W Maldives with points, booked for next Christmas at Westin, all with 240k points. Thanks Lee – did you book the Westin/W online or via the phone? Also, how was the W Maldives? DId you get much of an upgrade there? Also is 5 days enough to enjoy or not much else beyond sand, snorking, relax and eat? Online, get upgrade from beach villa to overwater villa as PPE. 5 days was okay for us as combined with spent New Year at Dubai. Snorkelling was amazing at W, way better than Conrad and Six senses. OT – one of the cards linked to my Curve card has expired. I’ve received a new one, but can’t see any way to update the expiry date/CVC code in the Curve app. Is there a way to do this or do I need to remove the old card and add the new one (I’ve already tried adding the new one but come up against an error – presumably because the same card number is already linked). I’ve had the same issue, needing to update my debit card which was coming up for expiry and had received the new card. I tried deleting the old one and adding the new one, and it just pulls in the old expiry date. I then tried deleting it, rebooting the iphone, leaving it overnight and then trying again but got the same result. Seems like a bug to me. I will report it and see what happens. They’ve not even updated the website to reflect their recent issues, Metal cards are still being sold with Amex functionality. I recently asked whether Nectar points could be used in Sainsbury’s to buy other gift cards. The consensus was no, but I have just returned after spending my wife’s 24,000 from an Amex card. I bought a £50 John Lewis gift card with some other stuff and paid with Nectar points with no problem. Incidentally, you need to make a purchase at the store and flash the card before you can use the points for anything. Interesting. Also been waiting to find a good use for my Nectar points. Any idea how many points were required for the £50 JL GC? They’re worth 0.5p so it’d be 10k Nectar. Consensus was wrong then Mark, this has never been a problem. The only issue is that it was necessary to have used your nectar card in the store in question before trying to redeem points for a giftcard. Or redeeming points for anything. you need a previous visit to the store before you can redeem for gift cards? has anyone experienced it not working and then worked on the second visit in that case? Yes, told it was in T&C by staff but did not check. Actually for any purchase using points inc petrol. OT – Plat charge card, does anyone have the link to apply for the Plat credit card (Spend £500) get 2,000 MR I think it was. There is an upgrade from the PRGC Charge card, to the Plat Charge Card. Not available from the newish gold credit card. Targeted in theory, but worked for most. @Rob – You will know the one! I think that this companion credit card is now only available if you are targeted, and not very often! It would be offered in your online account just under the menu bar with the picture of the card at the end. How long should it ordinarily take for Tier points earned via QR to credit to my BAEC account? I made sure to include my BAEB number at the time of booking and am not a privilege member…. TP’s on Partner Airlines can take up to four weeks according to the BA blurb. It only happens on Wednesday. So if it didn’t happen yesterday, it will happen next Wednesday. Was collecting 5 avios for each £1 spent instore on Caffe Nero – through Avios then BAEC – one of several outlets where you registed your Masterard or Amex online then earned miles without thinking about it. These have stopped crediting, and I can’t find details on BAEC or Avios e-shop pages (there’s a ‘not available’ message on Aer Lingus. Asked about this before, and somebody replied saying I was wrong and in person earning was still active. Is it, though? And what about Tyrwhitt? Tyrwhitt is totally separate because you have to hand over your BA number in-store and they credit the Avios manually. No idea what is happening with ‘instore rewards’ to be honest. Should anyone with large ZEEK credit be worried tonight? and about £400 to me! I have just checked mine and I have about £250 balance. This Zeek balance was purchased using Paypal and shows in my online account. Would PayPal pay up if ZEEK shuts the shop? It was almost 6 months ago though! “Purchase Failed” – multiple cards. Looks like they are shutting down shop (that was on zeekshop dot com, rather than zeek dot me). Zeek was too good to be true with all the discounts it offered and bonus cash back through the cb sites which is why I never used them. Interesting. Yesterday we were told to remove Zeek links from Shopper Points immediately. When this happens it usually means the company has gone bust. However, I went to the Zeek website and all seemed fine. I did a press search and all seemed fine. Clearly not. I am only £3.40 out of pocket luckily. Told by whom, Rob? The affiliate network? They went quiet on me last week. If the figures above and reported elsewhere are correct then they have seen this coming along way off. the whole zeek thing always seemed a bit fishy. i hope people don’t end up too out of pocket. OT – curve. Technically, it’s cost me nothing yet because my curve top up hasn’t landed on the Amex. BUT I had a refund to my curve Amex a week ago now, which hasn’t showed up. I have no doubt that the curve top up will eventually land on my Amex (how could it not?) but I have every concern that my refund has now been lost into the ether. I will be patient for now, but it would sure be nice to know what’s going on soon! OT Mexico Hilton. Upgraded gold to a suite with executive lounge access. Had quite good luck with IHG and now Hilton in Mexico which I didn’t expect with lots of Americans here too who I assumed with have gold.